A chance to create, collaborate, inspire and explore all different aspects of art and design has won a team from the University of Sunderland a top award. 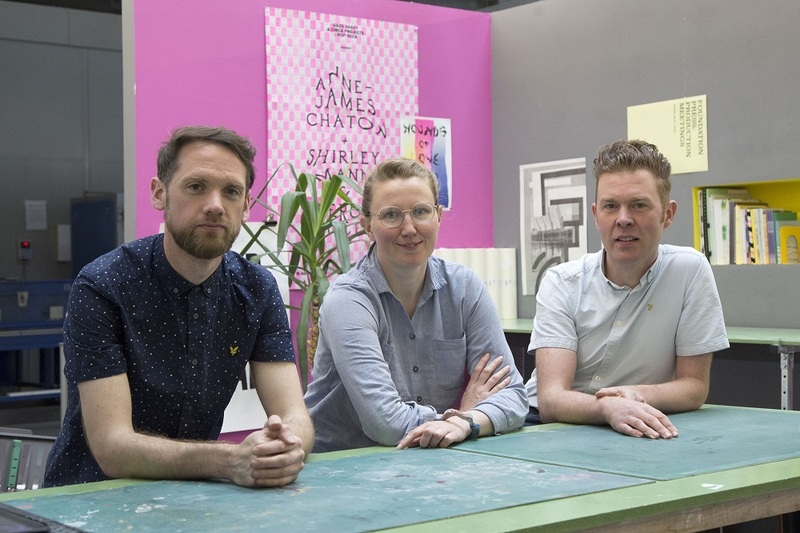 Foundation Press was launched by UoS academics Joe Woodhouse, Adam Phillips and Deborah Bower; all staff from the Foundation Diploma and the Art and Design Extended programmes. The idea was to create a project which would act as a ‘bridge’ for graduating students between university learning and real world working in the creative industries. Based at the National Glass Centre, Joe is Programme Leader, an artist, academic and researcher; Adam is an academic tutor and also a curator/co-founder of the high profile regional arts organisation, CIRCA Projects; while Deborah is an academic, artist and designer who utilises print and moving image. Foundation Press is an experimental printing press and a teaching and learning initiative established in 2012 and developed by the trio, drawing on their skills and experience. Now, the initiative has been named a winner in the Collaborative Award for Teaching Excellence (CATE) 2018. Much of their work was supported by the Robson Real World Fund, a DOSH (University of Sunderland Development Office) scholarship fund which allows University staff to support current students to undertake a live project or opportunity complementing their studies. Over the last year, Foundation Press projects have been delivered in collaboration with Pop Recs Ltd, the Northern Gallery for Contemporary Art (Sunderland), BALTIC Centre for Contemporary Art (Gateshead) and Chapter Arts Centre (Cardiff). It often can be quite daunting for art and design students to successfully progress into the creative industries. Foundation Press offers this experience which, in turn, makes a big difference to the way students feel about their ability to contribute outside of university life. Joe Woodhouse said: “We’re absolutely thrilled to receive this recognition from Advance HE. The project has developed due to the dedication of a small team of staff and the input from our inspiring students across the School of Art and Design. The additional Spotlight Award commended the project for ‘a highly creative, socially inclusive and entrepreneurial approach to building student confidence and enhancing employability within the creative industries'. Professor Kevin Petrie, Head of the School of Art and Design said: “Our vision in the School of Art and Design at University of Sunderland is to be recognised as a centre of excellence for art and design teaching based on distinctive programmes, collaboration and for the positive creative contributions our students, graduates and staff make to our university, city, region and beyond.